When it comes to selecting bathroom fixtures, the toilet is one of the essential components. Frankly, its appearance has to be taken very seriously -- it can ruin or enhance the over-all look as well as functionality of a bathroom. It's critical to pick a model that is pleasing to the eye, easy to clean, and sustainable. Usually I turn to one favorite brand and model. But bathroom fixtures are constantly evolving. What if there is something better out there, and I am not aware of it? OK. I'll search "far and wide" for new possibilities. I'll look online and visit various showrooms to see what's available. Perhaps, I can finally diversify. Starting the exploration online, I check out TOTO website. 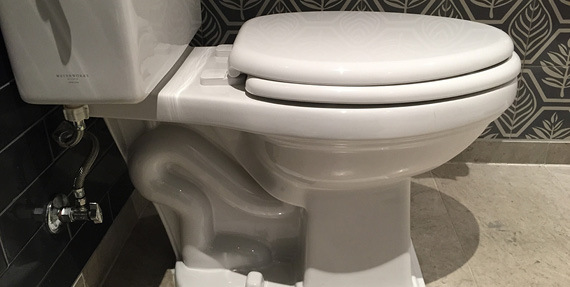 Immediately, I have to make a choice: is it a one-piece, two-piece or a wall-hung toilet? A two-piece toilet is most economical. Wall-hung is the cleanest, but it requires an in-wall tank system. Just like other bathroom fixtures, toilets come in various styles: modern, transitional, classic, and commercial. My personal preference is sleek and streamlined, otherwise known as modern. Even a "modern" toilet by TOTO is not simple enough for my taste. What's up with those toilet seats? They seem very bulky. b) round-front bowls require less space and are good for small children. c) exposed trapway makes it hard to clean because of its location behind the bowl. 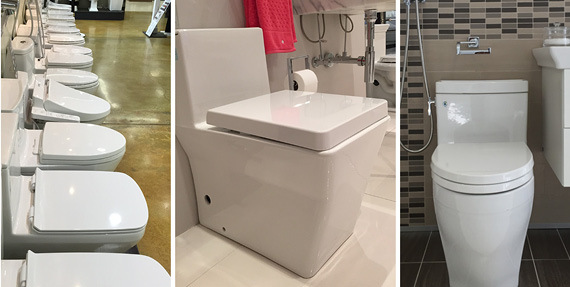 With their concealed tanks and minimal footprints, a wall-hung toilet offers some distinct advantages over a standard floor-standing type. It is particularly suited to small bathrooms, since it saves at least a foot of space compared to the longest floor-mount models. And because the mounting hardware is completely concealed, a wall-hung toilet has a sleek, seamless look and is easy to clean. Aquia Wall-Hung by TOTO is very sustainable. However, my preference is Duravit. The are in the same price range. Next option is a floor-mount model with in-wall tank. It's less expensive than the wall-hung. I love this model by Duravit! 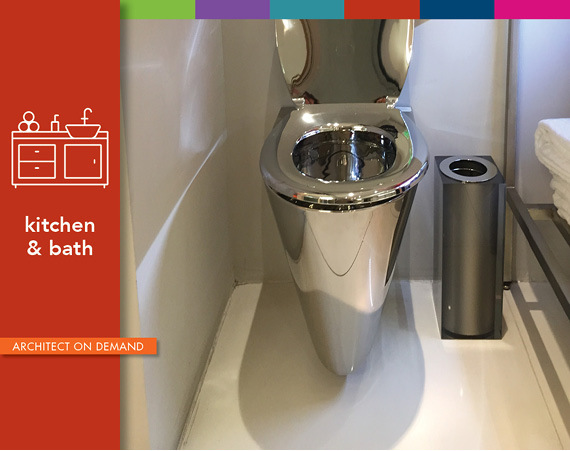 Then, there is a one-piece toilet that integrates tank and bowl into a seamless, space-saving design. Some low-profile models can be installed under a vanity extension when space is at a premium. In addition to Starck 2, Caro, Pura Vida, and Vero toilets by Duravit are quite beautiful. 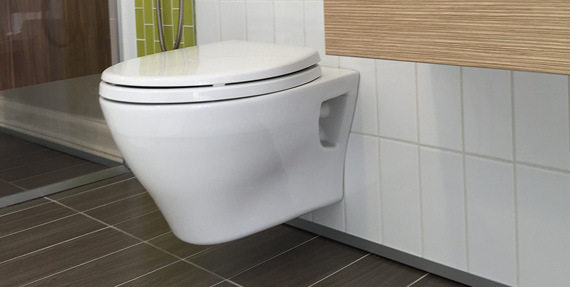 Two-piece toilets feature the traditional design of a separate tank and bowl. When replacing an existing toilet, it is necessary to pay attention to the distance between the outlet pipe and the wall behind the toilet, also known as the rough-in dimension. 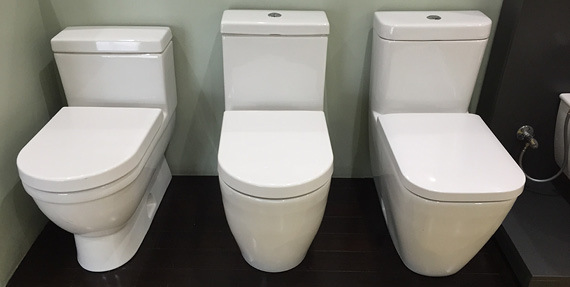 Toilets are available in various sizes to fit different rough-ins, so choosing the right size is crucial. To find out the size of your toilet rough-in, simply measure from the wall behind the toilet to the bolt caps of your current toilet. Do not include baseboards in your measurements. Well, this concludes the overview. I hope it was informative. In case you have further questions about selecting a toilet and/or other bathroom fixtures, don't hesitate to ask here.